If you are working in a large corporate environment, chances are likely that your business data is in SAP systems. SAP is a leading enterprise software vendor. Traditionally SAP was a closed environment using proprietary UI solutions. More recently, however, SAP is opening its ecosystem by embracing open web standards and partnering with leading client framework vendors such as Sencha. In this blog I will show how you can use Sencha Touch to create mobile apps that connect to SAP business data. Our integration will be based on SAP NetWeaver Gateway and Sencha’s SAP OData connector. So what is OData? OData (Open Data Protocol) is a set of conventions for URLs and data formatting for REST APIs. OData is an open standard and backed by Microsoft, SAP, IBM and others. Check out the OData site and the examples to get a quick impression of the capabilities and conventions of OData. 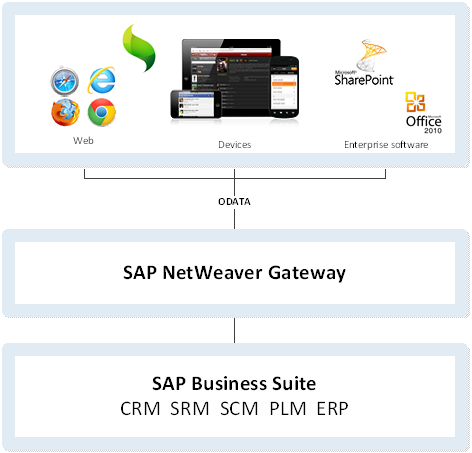 SAP NetWeaver Gateway is a SAP server add-on that allows mobile devices and other consumers to connect to SAP systems using OData-based REST services. The SAP Gateway front-ends various SAP systems like ERP, CRM, SRM and enables controlled read/write access to business data using HTTP and OData. SAP graciously provides an online demo system where you can test-drive the SAP Gateway. Our mobile app is going to connect to this demo system,but you will need to go through the account registration process to get a demo account. Check out the getting started document. On SCN (SAP Community Network) you will find more information on SAP NetWeaver Gateway and you will also find examples of other integration scenarios, e.g. 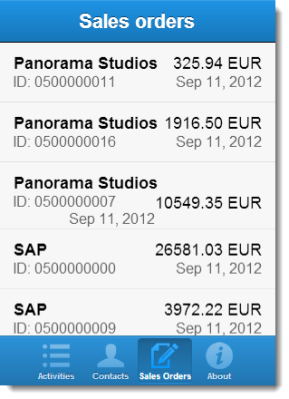 using SUP (Sybase Unwired Platform, renamed to SAP Mobile Platform in version 2.2) in combination with Sencha Touch. Last year, Sencha and SAP announced their partnership in the mobile space. As a result, Sencha has delivered an SAP OData proxy which makes it easy for Sencha Touch developers to connect to SAP NetWeaver Gateway. Get the latest version of the Sencha SAP OData connector here! You will need the OData.js file for the sample app below. 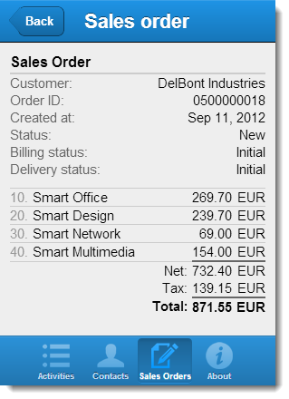 We’ll build a Sencha Touch app that fetches TravelAgency data from SAP NetWeaver Gateway and displays them in a grouped List. The easiest way to get started with Sencha Touch is to include the hosted library from http://cdn.sencha.io. 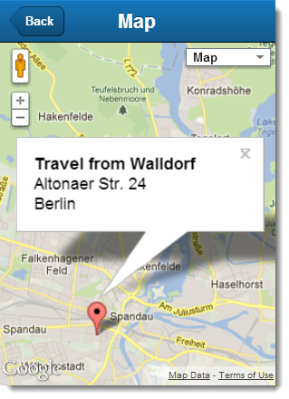 Now, let’s define the Model for TravelAgency in model/TravelAgency.js, using the SAP OData proxy. Please note that I included a grouper function. 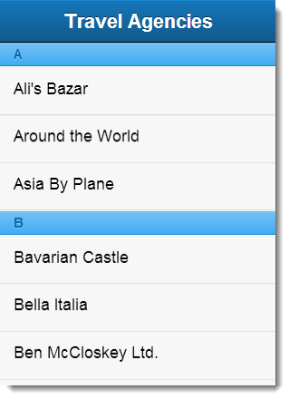 It returns the first letter of the Travel Agency’s name and is used to build a grouped list, which we will define next. So far, we have used the SAP OData connector to fetch data from the SAP NetWeaver Gateway server. However, we can modify server data just as well! In the following example we will create, modify and delete a Booking for a Flight in the SAP NetWeaver Gateway Flight service. The exact semantics and allowed operations on the SAP data are determined by custom configuration and coding in SAP Netweaver Gateway. 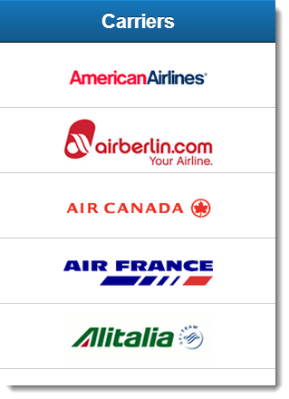 In the Flights service, the Booking record is not removed from the database. Instead, the Booking is marked as ‘Cancelled’. It’s time to wrap up! In this post we have introduced the Sencha SAP OData connector and provided examples how a Sencha Touch app can interact with SAP data through SAP NetWeaver Gateway. I hope this helps you get started with building SAP mobile apps with Sencha Touch.